PM, President, and MKs attend swearing-in ceremony of new Supreme Court head, speak of need to prevent judicial overreach. Justice Esther Hayut was sworn-in today (Thursday) as the 12th Chief Justice of the Israeli Supreme Court. Hayut replaces outgoing Chief Justice Miriam Naor, who retired after three years in office. The swearing-in ceremony was attended by President Reuven Rivlin, Prime Minister Binyamin Netanyahu, outgoing Justice Miriam Naor, Justice Minister Ayelet Shaked and Knesset Speaker Yuli Edelstein. Prime Minister Netanyahu said at the ceremony that "in all democracies there has been a constant debate about marking the boundaries between the branches. This is not a violation of democracy. Rather, it is the essence of democracy." The Prime Minister emphasized that "if there is anything that must not change, it is the necessity of a strong and impartial court. This has not changed and will not changed." President Rivlin said at the ceremony that "there have recently been increasing fears that judges and justices have become involved in judicial decisions that deviate from the interpretation of the law and lead to interference in the act of legislation or to an illegal invasion of the government's authority." "In addition, this situation attests to a new and unacceptable trend. It attests to the long-standing practice of raising issues that are at the heart of the Israeli public debate in the courts, such as issues of religion and state, issues relating to natural resources, the Israeli-Palestinian conflict, the status of foreign migrants, and Israeli democracy. "And now," the president added, "the same issues on which the court has decided to rule in accordance with the duty imposed on it and the rules of law that it is subject to, has indeed approached the realm of executive and legislative authorities. I expressed my opinion more than once, as a member of the Knesset, and later as Speaker of the Knesset, about the absence of our Basic Law: Legislation. I warned of the danger of the blurring of the boundaries between the branches." 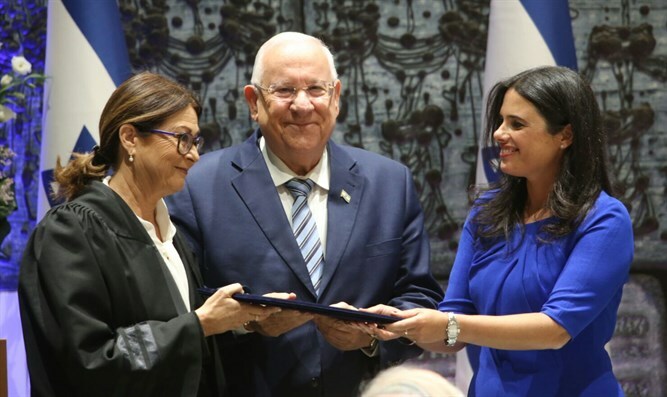 Justice Minister Ayelet Shaked said at the ceremony: "'The court does not dominate, cannot dominate, does not need to dominate all areas of our lives. There are various limits on the court.' That is what the new Chief Justice, Ester Hayut, wrote in an article about the limits of the court's authority." According to Shaked, "In the first decades of the State, the Supreme Court set itself clear boundaries before deciding on ethical issues that were politically contested, and it gained the public's confidence in the broadest possible way. However, since the 'Constitutional Revolution,' the court has unfortunately become a party to public disputes, and there has therefore been a decline in the public's trust in this institution." "The law is the most accurate expression of the outcome of the encounter of desires and views of individuals in society. Formalism does not mean a ruling in a system devoid of values. On the contrary, it means respect for the values ​​of the public as expressed in the product of their choice." Shaked cited the words of former Supreme Court Chief Justice Moshe Landau, who predicted that the 'Constitutional Revolution' would result in a decline in public confidence in the court. "Unfortunately, his prediction has been fully realized." She pledged to work to pass a new Basic Law to restore the proper balance of power. Minister Shaked turned to President Hayut and said, "I am certain that the Supreme Court under your leadership will continue to serve as an address for justice and for the protection of human rights, while at the same time preserving the boundaries of the court. It will strengthen our democratic system and restore public confidence in this important institution, and I am confident that we will work together with fruitful cooperation to advance the system."